Even though it was a windy, cold day outside, the girls enjoyed the sun coming into the sun room this afternoon. Jazz says, "This new teething ring is pretty yummy!" Here's Jazz in her favorite position at the end of the day...sound asleep in one of the many dog beds throughout the house. As you can see from this video, Tess and Jazz are really starting to have fun together. They love to wrestle and play tug. Tess is realizing that Jazz can be fun to have around and Jazz just adores her big sister! Just wanted to post some photos that I received yesterday of Tess at an agility trial back in December (click on any photo to enlarge it). As you can see from these pictures, Tess really loves agility! At this particular trial, she earned her CPE Standard Level 1 and Handler Games Level 1 titles. We're hopeful that some day Jazz will follow big sister Tess into the agility ring. 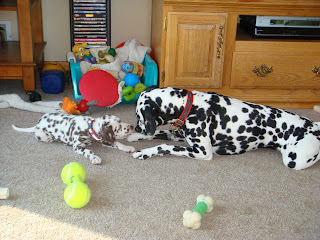 The adventure of the day today was learning to play tug with Tess. Jazz had a lot of fun with this game, although we had to lend her some assistance, as she was no match for the exuberant Tess! If you haven't detected the pattern yet, all of Jazz's activities end the same way...happily sleeping and dreaming of our next big adventure. My friend Amy teaches kindergarten, and her class was learning about how baby animals grow and change. 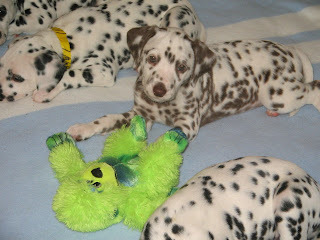 Our breeder posted pictures of the puppies to a blog from the day they were born until they all went home with their new families. The kindergarten kids followed this blog while learning about baby animals, so Jazz and her brother Pete went to visit the class today. Kids, adults, and puppies all had a wonderful visit. We'd like to thank the kindergarten class for all the great gifts they gave to Jazz and Pete and for the wonderful drawings they made for Cindy and me. This is Pete and Jazz in the dog crate after the ride home from kindergarten. They were two tired pups! The girls discover that it's fun to have someone to play with throughout the day. Jazz enjoys quite a selection of bones!! Jazz had her first experience in the snow today. 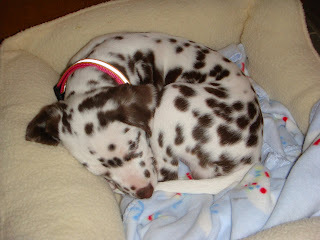 After a tough day of playing with her big sister, Jazz likes to curl up for a good snooze! In preparation for Jazz's arrival, big sister Tess decides to check out the puppy crate to make sure everything is in order. 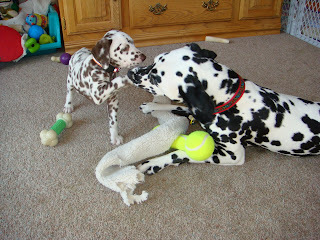 Jazz arrived home this afternoon and she and Tess first met through the puppy pen. As Jazz became more comfortable, we introduced the girls to each other and all went well. Today has been the coldest day of the year, so Jazz needs a sweater when she goes outside! It didn't take long for Jazz to cuddle up and get comfortable. Starwood's Touched by an Angel, NA, NAJ, OA, OAJ, AXJ, AX, CGC, TDI, PJ1, PG1, PK1, PJ2, PR1, PS1, PD1, PK2, PG2, PS2, PR2, PD2, CL1-R, CL1-H, CL1-F, CL1-S, CL2-R, CL2-H, CL2-F, CL2-S, CL3-R, CL3-F, CL3-S, CL3-H, CL4-R, CL4-F, NJC, NCC, NAC, TG-N, TN-N, OJC. 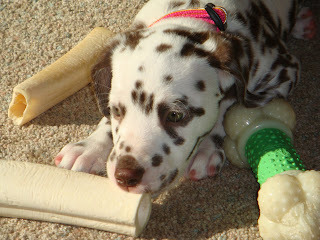 "Tess" became our pride and joy in June of 2005, thanks to Joni Shoup of Starwood Dalmatians. Tess is an awesome Dal who enjoys agility. She's earned many titles in different agility venues. She's also a Canine Good Citizen and registered Therapy Dog and makes regular therapy visits to a hospital and a nursing home. When Tess entered our lives, we truly were "touched by an angel." 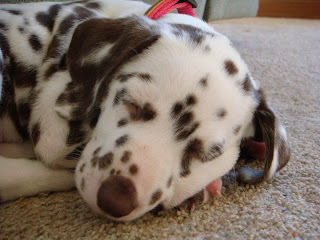 Kingdom's All That Jazz, RN, RA, CGC, TDI, CL1-R, CL1-S, CL1-F, CL1-H. "Jazz" is a liver-spotted Dalmatian who stole our hearts in January of 2008. 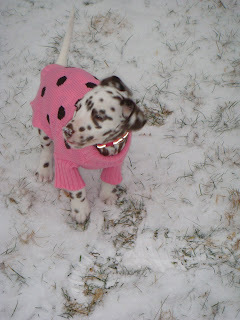 Jazz was bred by our good friend LaDonna King of Kingdom Dalmatians. We've admired Jazz's Mom, Gia, for several years and are thrilled to welcome one of her puppies into our family. 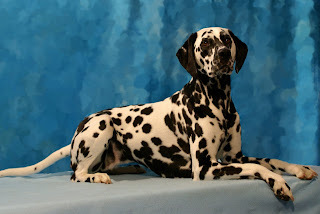 Jazz's Dad, Tolliver, is a sweet, handsome boy co-owned by friends Nanci Good of Pinebrook Dalmatians and Barb Allison of Rim Rock Dalmatians. Jazz is also a Canine Good Citizen and registered Therapy Dog, having passed her CGC at the age of nine and a half months and her TDI just five days after her first birthday!